The amphitheatre is a Roman invention, but ... What is an amphitheatre? 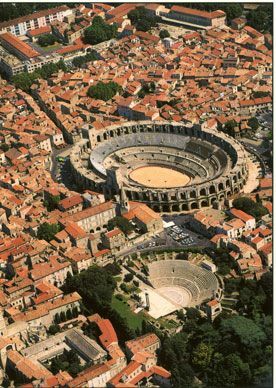 Now before we start, repeat after me: an amphitheatre and a theatre are different types of buildings. 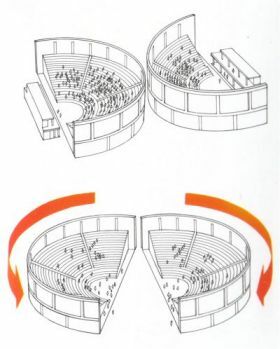 Amphi-theatres are "theatres in the round": amphi- means "around" in Greek. A theatre is a space with a stage, and the audience is on one side of it. People need to hear, so a theatre is relatively small. An amphitheatre is for action: it's a sports arena, where the spectators sit around the field. They need to see, but they don't really need to hear, so an amphitheatre can be much larger. As explained in the games page, the first record of a gladiatorial fight dates back to 264 BC, when the sons of Brutus Pera offered such a spectacle in the Forum Boarium in Rome (an area on the left bank of the Tiber used as a cattle market) to honour the memory of their father. Again in 216 the Forum hosted a combat of 22 pairs of gladiators; in 183 sixty pairs of gladiators fought at the funerals of Publius Licinius Crassus; in 174 a show lasted for three days. For a long time in Rome, for lack of a proper amphitheatre, the shows were organized in the Forum or in the Circus Maximus. In the Forum stalls and awnings were prepared for the spectators. In 384 BC censor Gaius Maenius had wooden balconies built on top of the shops around the Forum, and since then the word "maenianum" indicated the stalls of an amphitheatre (this according to the grammatician Sextus Pompeius Festus, as reported by AA.VV. Il Colosseo, Electa). The oldest amphitheatres have been built in Campania; some (at Capua, Literno and Cuma) can be dated at the end of the II century BC; some others (Avella, Pozzuoli, Telese) at the middle of the first century BC. The one of Pompeii, probably the oldest one made of stone, dates back to 69 BC. 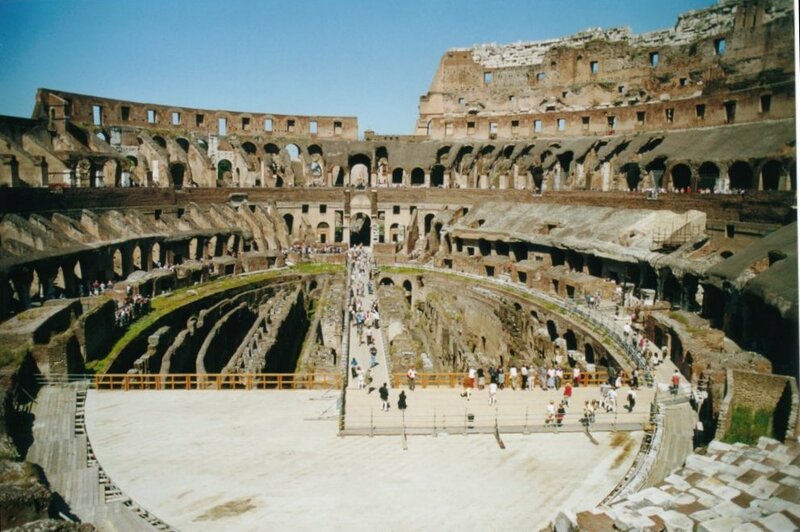 In Rome the law prohibited the building of structures for shows. Pompey in 55 BC managed to build a theatre only by justifying it as an extension of the Temple of Venus, thus overcoming the ban. ... theatra iuxta duo fecit amplissima ligno, cardinum singulorum versatili suspensa libramento, in quibus utrisque antemeridiano ludorum spectaculo edito inter sese aversis, ne invicem obstreperent scaenae, repente circumactis  ut constat, post primos dies etiam sedentibus aliquis , cornibus in se coeuntibus faciebat ampitheatrum gladiatorumque proelia edebat, ipsum magis auctoritatum populum Romanum circumferens. (Pliny the Elder, Historia Naturalis, Mayhoff Edition, XXXVI, 117 - For more text click here). In the meantime the word amphitheatrum started to indicate the thing that was previously called spectacula, or in greek Theatron kynegeticon (hunting theatre). The first mention belongs to Vitruvius (De Architectura, I,7,1). When giving directions for the layout of a city, he says that "If there be neither amphitheatre nor gymnasium, the temple of Hercules should be near the circus." Apparently the amphitheatre could also be called "ovum (egg, probably because of the shape of the arena, Calpurnius) or more commonly "arena" or "cavea". The first stone amphitheatre of Rome was built by Statilius Taurus in 29 BC somewhere in the Campus Martius (its precise location being a matter of fierce debate). It seems that wooden structures continued to be popular, regardless of the danger. In 27 AD in Fidene, not far from Rome, one of these wooden amphitheatres collapsed under the excessive weight, killing 20.000 spectators (if we believe Suetonius), or killing and wounding 50.000 (according to Tacitus). Taurus' amphitheatre, though still in use for a long time, had become inadequate for the splendid shows of the imperial capital, and it seems that Caligula, a great lover of the games had to host the shows in the Saepta, a big public space. Nero in 57 AD finally had a wooden amphitheatre built - it only took one year - for his shows. Suetonius and Tacitus tell us that it was a magnificent one: the awning was blue, and it used the longest wooden beam ever seen in Rome: 120 ft. long and 2 ft wide. The descriptions mention decorations of gems, gold, ivory. The wall around the arena had ivory rollers on top, that stopped the wild animals from jumping over, and for more protection a golden net was cast all around, with big pointed tusks leaning inwards. It seems that this theatre disappeared in the most famous of the roman fires: the one of 64 AD.